Sending love and smiles to children with illness around the world ~ Live. Share. Inspire. Each of us has his/her own canvass to paint. Every day, we are faced with this empty canvass and we are surrounded with all the paints in bright and dull colors, glitters and other art materials. It is up to us what color to choose and what decorations we will put in our canvass. This canvass is our life. We are all given the artist's freedom to paint, sketch and doodle. Our lives are embellished with different colors and accessories - one day yours is glittery, the other day it's gloomy as gray. What colors will you choose? This week, me and my officemates (friends) chose to paint our canvass with bright and inspiring colors. We chose to send love and smiles to children all over the world who are diagnosed with chronic illness. 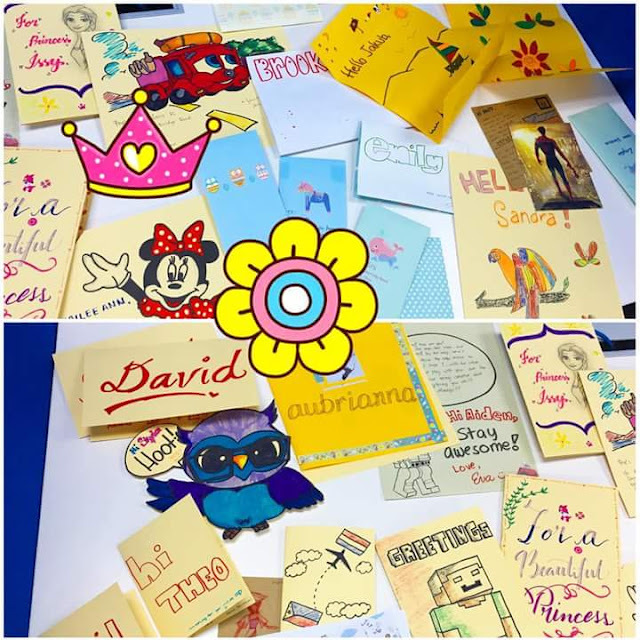 This week, we chose to let the bright colors and glitters on our canvass shine through half-way around the world. 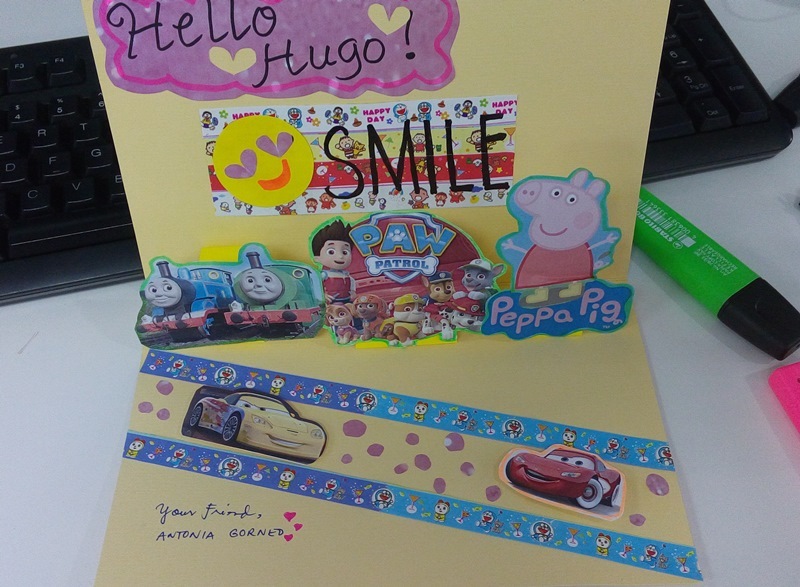 We handcrafted greeting cards to say 'Hello', impart our childhood stories, share our dreams in life, describe a favorite super hero and draw smiles to a number of kids in UK. Thanks to Dondon Tugas for facilitating the event. 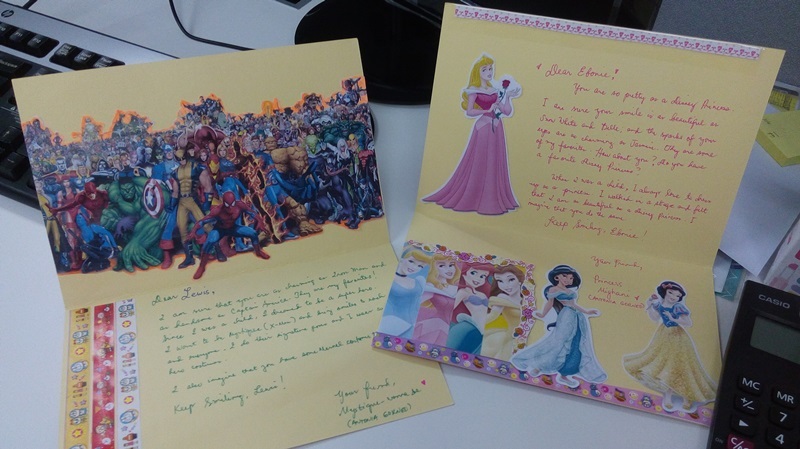 This is my first set of greeting cards for Lewis and Ebonie. These kids taught me that I don't need to be a Marvel superhero or a Disney Princess to inspire others and bring happiness to the world. This one is for Hugo! He has awesome imagination and I learned that having friends around will make my life happier and colorful. 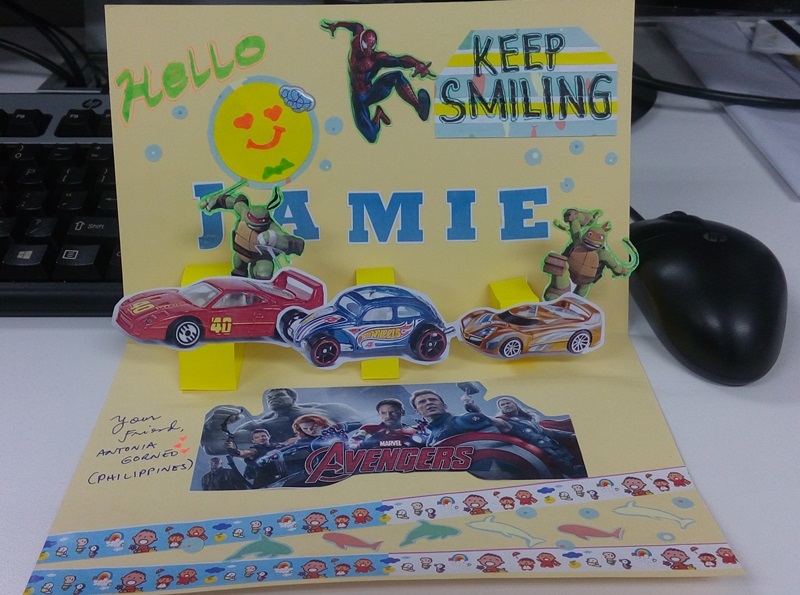 Jamie is fan of the Ninja Turtles, Spiderman and The Avengers. His story taught me that I should always smile because it will make my day brighter and light. Honey! She created a card for Lily who loves Tinkerbell. Honey inspires Lily to think of happy thoughts so they can fly like Tinkerbell. 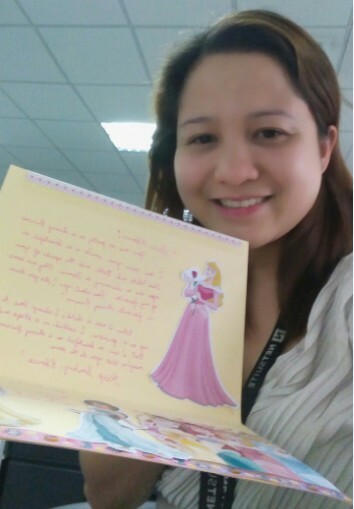 I added a picture of Belle for Ebonie to remind her that she is pretty as a Disney Princess. Spreading happiness is easy and fulfilling. We all have our share of problems and reality in life but we can always choose to inspire others to see the positive and bright side of it. We choose to share the #Suitelife and create #SuiteImpact all over the world. What would you choose?